The South Korean Parliament voted to impeach their president, Park Geun-hye, because of a corruption scandal. Park, the country’s first female president, is the daughter of former military dictator, Park Chung-hee, and won the presidency with that support. 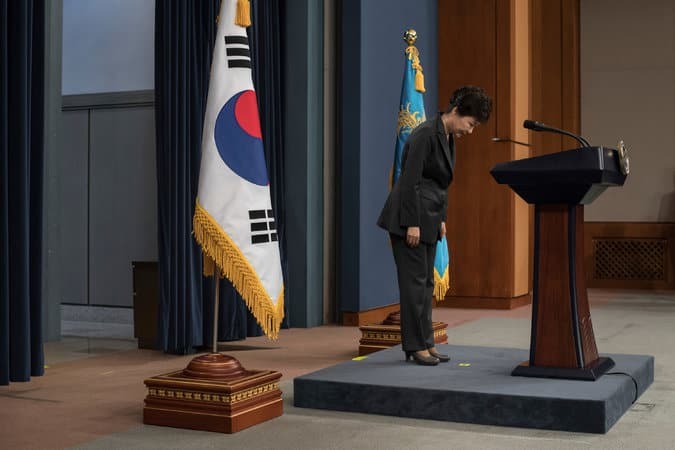 Park mentioned that she did not plan to resign. “I am gravely accepting the voices of the people and the National Assembly, and I sincerely hope that the confusion will come to a satisfactory end,” she said in a national broadcast. Park was accused of allowing a non-governmental friend to weigh in and influence topics from her wardrobe to who would be placed in official positions; she is also accused of extorting millions from South Korean companies with the help of this friend. At the hearing, Park gave her fourth public apology in less than two months, but stopped short of admitting wrongdoing. She instead apologized for a “lack of discretion and [her] carelessness. The South Korean Constitutional Court is currently considering whether she will be removed from her position or not—their decision will come in the next six months.